The Newfoundland is a strong, large, heavily-boned, powerful dog breed who loves water. The Newfoundland has an excellent swimming ability and has been known to rescue drowning victims with what appears to be effortless power. Good tempered and patient, the Newfoundland makes an excellent family pet. 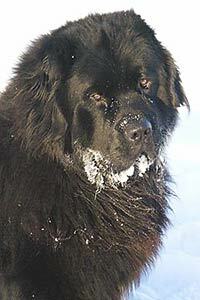 The Newfoundland originated in Canada. Male Newfoundlands range from 27 inches to 29 inches. Female Newfoundlands range from 25 inches to 27 inches. Male Newfoundlands range from 130 to 150 pounds. Female Newfoundlands range from 100 to 120 pounds. 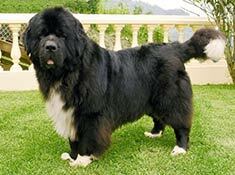 Newfoundlands are typically brown, black, gray or black and white (Landseer). 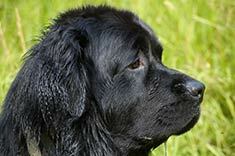 Newfoundlands have an oily and water resistant double coat. The outer coat is straight or slightly wavy and the undercoat is dense and woolly. Regular brushing is essential to prevent matting. The Newfoundland is a patient and generous dog breed who is devoted to its family. Initially suspicious of strangers, the Newfoundland makes an excellent watchdog. The Newfoundland is susceptible to hip dysplasia and hereditary heart disease. The expected life span of the Newfoundland is 8-10 years. A fairly big dog breed, Newfoundlands do not do well in apartments because they require a lot of space. Sensitive to heat, Newfoundlands do best in a house with a fenced and shaded yard. The Newfoundland is a very active dog breed and must be exercised daily. The Newfoundland is in the Working group. Newfoundland dogs have a double coat that makes caring for them more complex than small short-haired breeds. They shed with the seasons and the fact that they drool excessively makes caring for these gentle giants very time consuming. Newfoundland dogs are massive dogs that drool, then drool some more! It is common knowledge that Newfoundland dogs drool and shed, but many people don’t realize the extent of the drooling and shedding. If you like a clean, tidy house, you don’t want a Newfoundland as a pet. They shed excessively in the spring and fall. In fact, this process is more than just shedding. Newfoundlands “blow” their coats as new fur growth occurs. Hair and drool will be everywhere; on ceilings, walls, in food and in almost every nook and cranny. The drool is a sticky glue-like substance that’s very hard to remove and yes, your Newfoundland will drool in your lap and the lap of your guests. Before you bring your Newfoundland puppy home, enroll him in obedience school. Start the training as soon as possible for best results. Newfoundland puppies have very short attention spans and you must teach yours to pay attention when you speak. He needs to be socialized so he knows how to act around humans and other animals. Newfoundland dogs grow rapidly and are extremely strong, so you need to be in control from the very beginning of the dog/human relationship. Be prepared to buy lots of high quality puppy chow for your Newfoundland. He will need an excellent source of nourishment because of his rapid growth rate and will eat very large portions. However, when he is full grown, his metabolism will be slower than most large canine breeds, so you will have to be careful that he doesn’t become overweight. Your Newfoundland needs to be groomed thoroughly at least three times a week in order to control shedding and matting of his double coat. Grooming cleans the coat and skin and keeps odor under control. A long-toothed steel comb is a must, as is a wire slicker brush. Comb the fur back to front, then front to back. Be certain that the dog’s fur is brushed all the way down to his skin, but use caution so the dog’s skin isn’t harmed. Look for fur mats on the inside of the legs and behind the ears. Keep a close watch on your dog’s skin for parasites and other problems. Grooming your Newfoundland regularly will keep his coat and skin healthy and cut down on baths. If you bathe your dog at home, rinse well to be sure all the shampoo is removed from his coat. If soap is left in the fur, skin problems will occur. Toenails should be clipped weekly because of the dog’s size, but have to be done properly. Many times it’s far easier to drop your Newfoundland off at a reputable groomer’s to ensure he is properly groomed. Newfoundland dogs are usually healthy. They do have tendencies to have problems related to their size, which includes bloat, genetic heart problems and hip dysphasia. If the dog’s breeding ancestry is not of a high quality, other health problems may occur. Seek out a local veterinarian that specializes in large breed dogs. Take your puppy to the vet as soon as possible after you bring him home. The same day is perfect. Avoid allowing your puppy to come into contact with other dogs until all shots have been given and he is immune to disease. Have him examined every three months for hookworms, roundworms, tapeworms and whipworms. When he is grown, he should be checked every six months. Be sure he has a heartworm test and purchase heartworm medication to be administered once a month from June to December. In order to protect your Newfoundland from worms, be sure to pick up his stools after he goes. Also, protect him from flea and tick infestations, as they can cause skin problems and infections. Be sure to treat your dog’s bed and your house for fleas and parasites all in the same day or a re-infestation will occur. Newfoundlands are very docile indoors but very energetic outdoors. They love to play, swim, run and work. If you want your dog to remain physically fit and healthy, you must be sure he has a daily regime of exercise. Exercise also alleviates a wide range of behavioral problems. 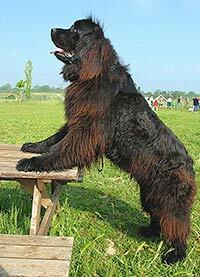 Female Newfoundlands grow to a height between 25 and 28 inches and when fully grown weigh between 100 and 125 pounds. Males grow to a height between 27 and 30 inches and weigh 150 to 170 pounds. 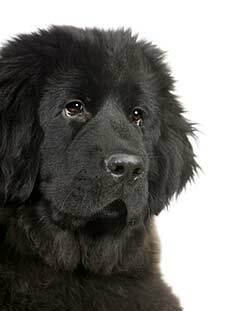 If you can put up with the drooling and shedding of a Newfoundland, this dog is fiercely protective and will bring joy, love, companionship and undying loyalty into your life. Find Newfoundland Puppies with our Free Breeder search!